We’d love to meet with you to strategize appropriate steps to achieve your financial goals. Through our various services, our firm helps individual and small business clients feel in control of their finances. Having a plan helps you sleep at night. Filing your annual tax return doesn’t have to be a painful process. Do you know there’s a reason the tax preparation industry is segmented? Each segment is valuable when serving its appropriate population, but one solution can’t fit all types of taxpayers. Do It Yourself software, tax franchise, small CPA firm or large CPA firm. Which is the best fit for you? WFA can help you find the right fit, even if it’s not with us. WFA knows a tax return is a very telling financial document that can help identify strategies to improve your financial life, but sometimes it’s hard to know when it’s time to pull in a professional. Let us help. WFA simplifies tax compliance so you prioritize your time and focus on running your business. Contrary to what you hear at a cocktail party, there are no tax ‘tricks’. But there are tax strategies. We don’t use jargon to discuss tax ideas, instead we communicate like a trusted advisor, working with you to achieve your goals. Since we only work with small businesses, we also understand how business goals and personal goals are intertwined. When you know better, you do better. WFA helps the new business owner navigate the intertwining landscape of business tax compliance. You can create an LLC yourself on-line, but do you know if your business should be an LLC? Or should it be a Corporation, or make an S-election? And if you should, how do you do this? Do you need employees or contractors? Do you need a sales tax number and what about payroll? Do you know what a set of books means? How do you create and maintain a set of books? The Start-Up Business Coaching contract helps the new business owner to know what they need to do, evaluate if they’re capable of doing it, and assess if you have the time to do it. The costs can be steep to unwind and clean up business records for owners who believe they can’t afford a CPA when starting out. Our coaching program is affordable and helps get your business on the right track financially. What do you do when a family member dies? The term “estate” sometimes implies wealth, but everyone will eventually die and the taxing authorities have a plan and process for your heirs to follow once you’re gone, regardless of your wealth. Do you know a separate taxpayer is created when someone dies? And that taxpayer, the estate of jane doe, has tax filing obligations. In those difficult and emotional times, it helps to have someone take care of the more pragmatic tasks, like filing the final tax return. The financial advice industry has become like Chuckie Cheese – bells and whistles to get your attention with generic advice that probably isn’t applicable for your circumstances. Do you need to talk about insurance? Retirement? Investments? Taxes? Your children when you die? Would you like a truly independent advisor who doesn’t get compensated on product sales? Then maybe it’s time you called Welch Financial Advisors. Our firm does fee based financial planning where the advice you get is independent. Our fixed fee is for our advice and assistance in implementing the plan. And because no financial decision should be done in isolation, if there are products that are needed to help achieve the financial goals (i.e. 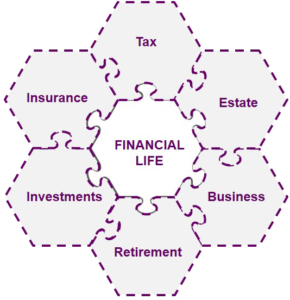 life insurance, investment management, estate tax documents, etc.) we help you find and evaluate the right professional to provide those products. Is it hard to understand financial professionals? Do they only know the rules and their industry jargon? Cecily Welch is skilled at combining her extensive tax knowledge with pragmatism. Because of this she has had multiple radio interviews, given presentations on financial well-being to tweens, young adults, retirees, newly single women, new law partners, and new entrepreneurs. If you’re interested in having Cecily speak to your group about taxes, running a financial household, or the business of running a business, give us a call. Welch Financial Investments, LLC is an affiliate of Welch Financial Advisors, LLC and provides clients with integrated fee only investment management services. WFI doesn’t seek to offer an investment platform that will be all things to all people, but for those people who are looking for a prudent, integrated investment strategy that is slow and steady, WFI can be a good fit. Often people have multiple investment accounts that were held at different brokers or self-directed. And although the total assets were significant to them, the balance isn’t significant enough to warrant quality attention from these providers. This generally means no overall strategy, a low level of service, and excessive fees. As a registered investment advisor, Welch Financial Investments has a fiduciary duty to our clients vs. typical brokers. For clients who have investible assets from retirement account rollovers, inheritance, or savings that don’t rise to the level of being an “A” client at typical brokers, we provide an integrated strategy for appropriate diversification and management of the entire combined portfolio. Our strategy is to focus on aspects of investment management that can be controlled. We do this by developing a plan and helping clients practice the discipline to stay with their long-term strategy. Our approach is to identify the client’s goals and risk profile and then focus on asset allocation, diversification, and minimizing taxes and fees. With Welch Financial Investments clients have confidence that their investments are being managed in a prudent manner for their circumstances.